Hiking and Trekking are both very popular activities for exploring, getting in touch with nature, fitness, and relaxation. Hiking and Trekking are both good for the body and mind. The words hiking and trekking are sometimes used to describe the same thing. They both involve walking and they are both outdoor activities. Hiking is more a leisure activity usually done on marked trails or roads and finished in a day or overnight. 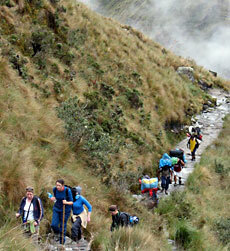 Trekking usually takes place over a number of days, can be more challenging and can take place on uncharted paths. See if you can find all the hidden Hiking & Trekking words in the game before your points fall to zero. Did you know "Hiking & Trekking" are both weight-bearing exercises and can help boost bone density? There is lots more information you can find out about Hiking & Trekking.